Last week I posted a tutorial covering the process of building a custom WordPress theme, and promised that the theme used for the post would be available to download for Access All Areas members. Well, here it is! 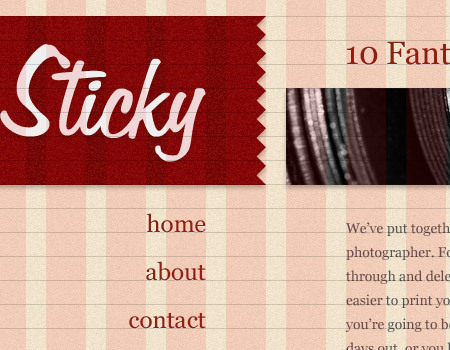 Sticky is a simple theme that boasts a sticky sidebar (hence the name!) and features a strict grid based design with subtle textures and a soft beige and red colour scheme. 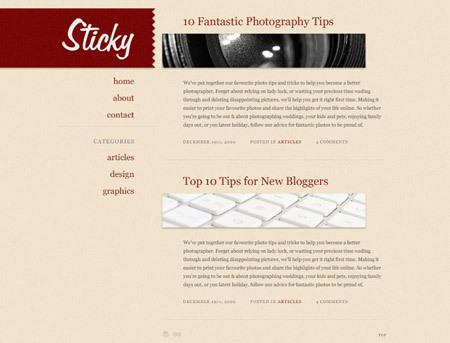 Sticky is generic enough to be used for any type of blog, but its classy styling would make it a great personal blog, or maybe one that’s based on your favourite hobby or passion. The main feature of Sticky is the sticky sidebar, which stays in place while the content scrolls past it. The whole design is based strictly on a grid, which provides a balanced layout with some touches of style with the offset post thumbnails. Touches of CSS3 styling add some fancy effects for viewers with modern browsers, such as the inset-text and soft shadows. Like the look of it? Get your hands on it for $7, and enjoy a whole months worth of extra premium content by becoming an Access All Areas member. Thanks Imon, I enjoyed building this one. If you’re going to be “inspired” by great site designs, at least try to improve on them. Other than the fact that it uses the ticket-style triangle patterned edge, and the Georgia font, which are two elements that appear on hundreds of designs across the net, what else are comparing? Maybe that the logo is in the top left corner haha? The red banner with the fancy white text (and ticket effect, as you noted) in roughly the same position in both designs both on a lightly patterned background. Both designs are two columns, left has logo and on the right is content. Have you never seen another two column design with the logo on the left and content on the right? I think it’s unfair to call rip-off! on such generic features. But I agree that the Analog site is very nice. You keep highlighting the features by themselves- yes that layout is not unique to analog’s site, however when you add in the fact that your logo looks almost exactly the same as theirs (same position, same background color, same text color, same border effect, same style font) it doesn’t exactly paint a bright picture. The two fonts may both be a cursive font, Chris’ is more hand written and realistic, while Analog’s is much more clean and unrealistic. Also, the logos may be in the same place (top left, like I’ve never seen that before), the styling is not the same. Chris “breaks the grid” by going all the way to the left side of the screen. 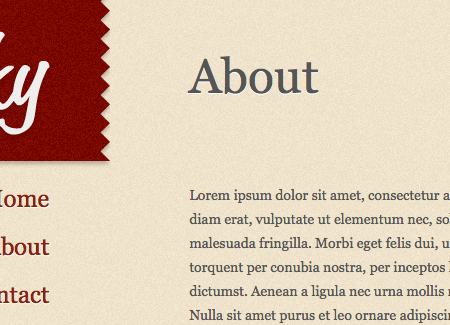 Chris uses a deeper red instead of orange and puts a drop shadow on both the banner and text. Loevly theme Chris. I love the colors and Georgia is one of my favorite (websafe) fonts. I’m going to have to agree with Daniel on this one. With Analog popping up on a number of CSS galleries and I’m sure they were featured in Smashing Mag too, this comes off as a quick and dirty knock-off to benefit from the popularity of the minimilist design. That said, I don’t see any Georgia on Analog’s site? You design websites and you use a browser that doesn’t support @font-face? For shame. I dint like it much. Its navigation @ the left is taking too much space, font-feel would’ve been better if we had sans-serif. But the sticky concept is good! It might not be to everyone’s taste but it was a feature I’d been itching to build into a site. Sans-serif was definitely an option, but I wanted to go for the classy feel of Georgia. Feel free to make modifications should you download the theme for yourself. Jesus, people – he’s giving away a free theme, and you’re bitching and moaning. When was the last time YOU contributed anything to the community? Chris, thanks for your generosity – the only issue I have is that the sticky sidebar doesn’t seem to work in Safari (4.0.4 on Mac). Actually he is charging $7 for the theme, but that’s beside the point. It’s plagiarism. I’m perfectly confident that I build this design with my own initiative. If you have a different opinion, that’s fine. As someone who’s had plenty of designs ripped off myself (that’s ripped like for like, not a comparison of similar design features) I know all about plagiarism, and wouldn’t steal a design, let alone sell it on my design blog! I have my own reasoning and thought processes for every portion of the design, including colours, fonts, layout etc, some of them were covered in the recent ‘Making of’ post, but I’m not going to bother writing them all out just to prove a point. Let’s put it to rest, eh? I agree with Chris! What is the matter with bitterness? If you dont like it – don’t use it, it’s that simple! But there is no need to step on the throat of someone who is doing an amasing job and is spending time and effort to give and to teach. I’m not a premium member, but I cannot help but comment that this is Chris Spooner’s site – thus him giving of his time and energy to put forth a nice clean design should be commended. To simply cry “plagiarism” is unfounded and amounts to nothing more than an incessant irritant. One could find innumerable sites with similarities on the web. Big deal. “Sticky” is by no means a ripoff. it’s obviously that Chris is got inspired from Analog guys but i do not think he stole the idea and the big differences can talk to prove that. Thanks for being such a saint Chris and not blowing up at such serious accusations such as plagiarism. With that said, I think it does look very similar to Analog. But this is the web, I’ve seen that “ticket” design used many times and I’m sure that the folks at Analog had probably seen that some where before and got inspiration from that. However, I do not consider your case plagiarism. It’s similar but so are about 150,000 websites that look just like, let’s say, Smashing Magazine. Bottom-line is that Chris has built a very reputable online presence and from most of the stuff I’ve seen is a talented blogger/writer/coder. To childishly come on his site multiple times to try to dislodge that by calling his design a copy and a “less attractive” version of something is simply absurd. You think Chris would destroy his reputation with a $X theme? Get real. My actions have not been childish in any way. If this theme was simply ugly or bad I would not have commented. I saw glaring similarities (too many to be coincidental) to the Analog site and decided to call them out. If everybody wishes to ignore the similarities for the sake of playing nice, that’s fine. Don’t claim to have integrity though. I have been following your blog from last month but I have not yet read your previous articles, But I just wanna say one thing man. Your the best designer I ever came across. I just wish I could be like you. Can you please guide me from which software’s to start. I’m a web designer and freelancer but now I have taken interest in making graphic and do everything like you do. nice theme. thank you for showing. BTW, I love your blog! I would like to make a point; there are more than 5 million designers in the world, similarity’s will always come into play. What we need to do, is be grateful for those who make the web community a better place to get inspiration, ideas and training from. Web Design is like Kung Fu, you never stop learning. i like it too chris. i do my own designing and printing stuff at psprint.com/stickers-labels, and this will also look good when printed on paper. Chris…I really like the look of this theme. I’m usually not a fan of the non-scrolling sidebar but I actually like your implementation. As to the complaints that it looks somewhat similar to the analogue coop site…welcome to the net where almost every site has it’s “analogue”…sorry I couldn’t resist. But thanks for the post and the tutorial. Great stuff and keep it up! 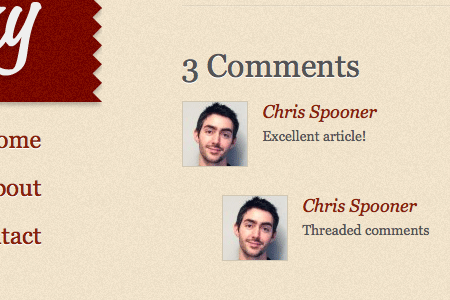 You have nice blog theme design! The look is great!!! but i think there is too much white space in it.. I like it. I love clean designs. Goodness. Stop busting the guy up. It’s not plagiarism. There are some similarities but that is the nature design. In case you didn’t get the memo, it’s all been done before. If you don’t like the theme then don’t buy it. But don’t accuse the guy of plagiarism. What a bunch of prima donnas. Hey Chris nice job. As far as the plagiarism complaints, people get over it. He didn’t steal anything. In the world of the internet there are going to be close similarities in any forum. Articles are being rewritten, products are being rewritten and reproduced and if you are going to scream plagiarism every time you see a similarity you may as well get out of this business. I haven’t seen one bit of content on the internet that couldn’t be called similar to some other content, it’s just a fact that people have similar ideas all the time and sometimes someone else does something very nearly the way you would have done it, right before yours is released. It happens. The thing that we must do is always try to improve upon what has been done and that is not plagiarism.